Reports of a rebounding economy have buzzed among experts but new unemployment figures reflect what many families headed by women of color feel, continued financial struggles and prolonged unemployment. Numbers released by the U.S. Department of Labor last week show the national unemployment rate has increased to 9.8 percent. But unemployment rates in communities of color hover above the national average. African-Americans' unemployment rate is 15.4 percent and 12.7 percent for Latinos. However, Asians' jobless rate is 7.4 percent. 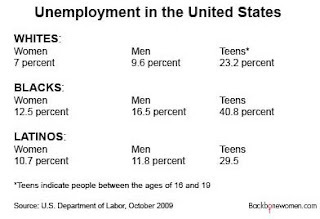 Whites have an unemployment rate of 9 percent. African-Americans lead the unemployment rates among women at 12.5 percent. Latinas have a 10.7 percent unemployment rate compared with the 7 percent unemployment rate for white women. 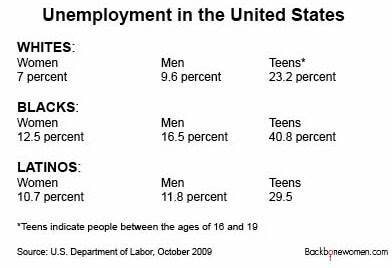 Overall women have an unemployment rate lower than men, with all women having a 7.8 percent jobless rate and all men standing at 10.3 percent. But the disproportionate unemployment numbers among African-American women and Latinas are troubling considering the high number of female-headed households in some communities of color. The new Department of Labor numbers show that the amount of people out of work for 27 weeks or more is now 5.4 million. More than 15 million jobs have been lost since December 2007. Prolonged unemployment combined with high child poverty rates in communities of color are creating an economic emergency in families that were already leaning toward financial fallout. More than 34 percent of African-American children are living in poverty compared with 32 percent of Native American children who are poor and 27 percent of Latino children in poverty, according to the Children's Defense Fund. Asians' child poverty rate is 12 percent compared with 13 percent for whites. All Americans hope for a swift financial rebound. Women of color and their families directly affected by the recession await economic recovery with urgency.